Responsible for drawing blood through a procedure known as venipuncture, phlebotomists take blood for tests, transfusions, research, or donations. Most phlebotomists work in hospitals, medical or diagnostic laboratories, blood donation centers, and doctors offices. Working as a phlebotomist can be an extremely rewarding career, as you’ll spend your entire day helping people, but what does a day in the professional life of a phlebotomist look like? Phlebotomists normally start their day early, around 5 or 6am. This is because they are responsible for ensuring that blood results are both consistent and accurate. In order to ensure this, they need to draw blood from patients before they have had a chance to eat or do any type of exercise or activity which could interfere with test results. They are given orders from different departments within their healthcare provider that indicate which patients to draw blood from. It is important that phlebotomists have an eye for detail as they are responsible for identifying the correct patient, medical records and date of birth before drawing blood. Drawing blood from patients involve applying a tourniquet, selecting a vein, inserting the needle and collecting the blood for later testing or transfusion. While the technique might seem relatively simple, many people are uncomfortable with the idea of needles and blood drawing. It is one of the duties of phlebotomists to put those patients at ease and make sure the act of drawing blood is as painless for them as possible. Phlebotomists work with a range of patients across the course of a day and certain patients, such as children, pregnant women, newborn babies, post-surgery patients and the elderly may require slightly more preparation or consideration when it comes to drawing blood. Once the blood has been drawn, it needs to be carefully marked, arranged by the type of test that is to be performed on it, and sent to a lab for analysis. Analysis of drawn blood is an important diagnostic tool for healthcare providers, making the role of the phlebotomist incredibly important. The ability to collect data from a properly drawn blood sample can literally save a patient’s life. Occasionally, phlebotomists may be called upon to assist with a blood transfusions on a critical patient. During these procedures, they are responsible for ensuring that the new blood is cross-matched with the patient’s blood type and that the necessary equipment has been set up for a proper transfusion. At Northwest Career College, we pride ourselves on providing the premier Phlebotomy Program in Las Vegas. Our phlebotomy students have an 89% national exam pass rate and you can graduate in as little as three months. 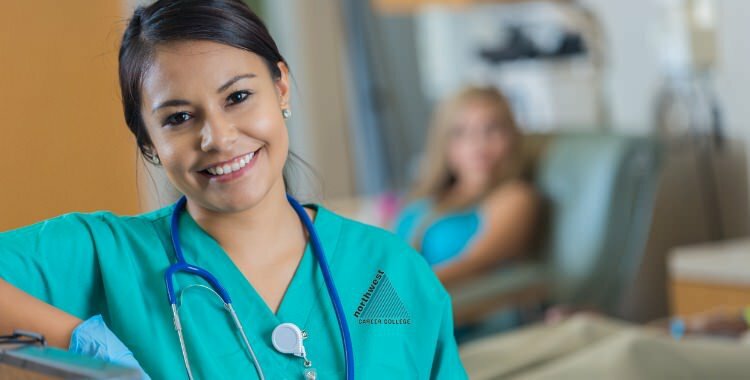 Our established, seasoned instructors will take you through every aspect of Phlebotomy and Northwest offers day, afternoon and night classes to accommodate your busy Las Vegas work and family schedule. Call us today at (702) 403-1592 to speak to one of our admissions specialists about your new Phlebotomy career. Previous Blog: How To Deal With Stress Before Your ExamNext Blog: What To Look For In A Healthcare Employer?